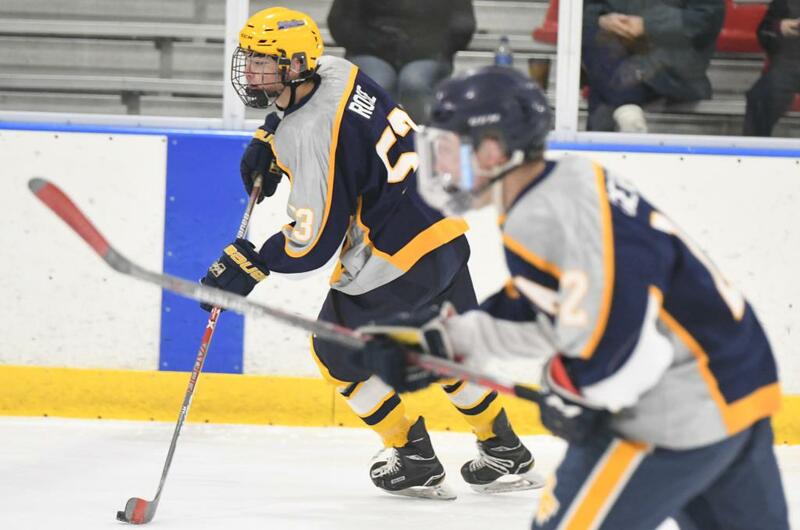 The Springford Rams scored six, second period goals to jettison past the Bishop Shanahan Eagles 9 – 2 on the strength of Liam Rose’s four points (2 goals and 2 assists) and Ryan Schaeffer’s three points (1goal and 2 assists). After entering the second period down 2 – 1, the Eagles’ Ryan Miller would tie the game at two. The Rams then scored six unanswered goal to take control of the game. Drew Clifffored stopped 14 of 16 shots in the win while Domenic Veneziale turned aside 33 of 42 shots. The Bulldogs survived a furious Cougars rally to hold on and win 6 – 5. After being down 3 – 0 going into the second, Springfield scored three goals in the first three minutes of the middle stanza to tie the game. Will Treiman would give the Rams a 4 – 3 with 4:12 into the second. A minute and a half later Alex Broder would make it a 5 -3 game. After the Cougars’ Aidan Smith scored his second goal of the game to bring Springfield within one, Anthony LePera would score his first goal of the game to close out the scoring for the Bulldogs. Smith’s third goal of the game would make it 6 – 5. Justin Greenspan turned aside 17 of 22 shots for the Bulldogs while Luca DiMarcantonio stopped 27 of 33 for the Cougars. Box score. Garnet Valley used a hat trick from Patrick Vaughn along with goals from Luke Peterson, Joseph Shull and Matthew Wood to down Radnor 6 – 1. Lee Wheeler stopped 23 of 24 shots for the Jaguars while Robert Hobbs turned back 21 of 27 shots for the Raiders. Box score.